If you're planning on trying to Boston Quality or you have a finishing time goal, Don't go out too fast! 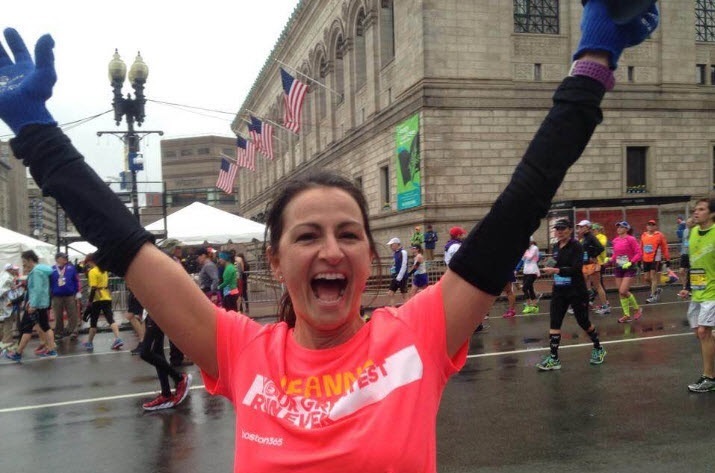 This was my biggest mistake when I ran my 1st Boston Marathon (and a few other marathons). I heard this advice from so many people. I even got this same advice from Kara Goucher that I had met 2 days before I ran that Boston Marathon. I told her that I was running my first Boston and her advice was "Don't go out too fast". So I got to the start line and started running! All the advice that I had gotten was gone. What did I do? I went out to fast. I remember looking at my watch and thinking "Wow - am I killing it! Mile one done! What a pace"! Then the miles started creeping up. I got to mile 13 and crashed and burned. I ended up walking towards the end of the race. I finished, but not with the time that I set for my goal. I was beat up both mentally and physically. When you see the photographers - throw your arms up, smile and scream "Woooooo" (this is an okay time to be a woo girl). You'll thank me after you get your race photos. I highly recommend putting your name on your shirt! Let the crowds call out your name especially when you start to get tired.